As you walk through a narrow path covered with the underbrush and finally emerge atop the edge of a large plateau rife with majestic creatures, it’s hard not to have your breath taken away. 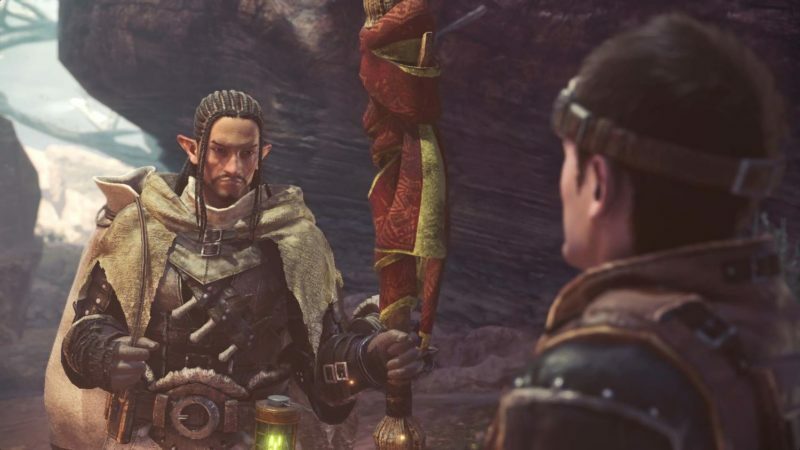 Monster Hunter World is a game that is not just about hunting monsters, it is also about a deep reverence for the act of doing so. There’s a sense of scale and beauty here that is unmatched, which makes Monster Hunter World easy to recommend even with its many barriers to entry. 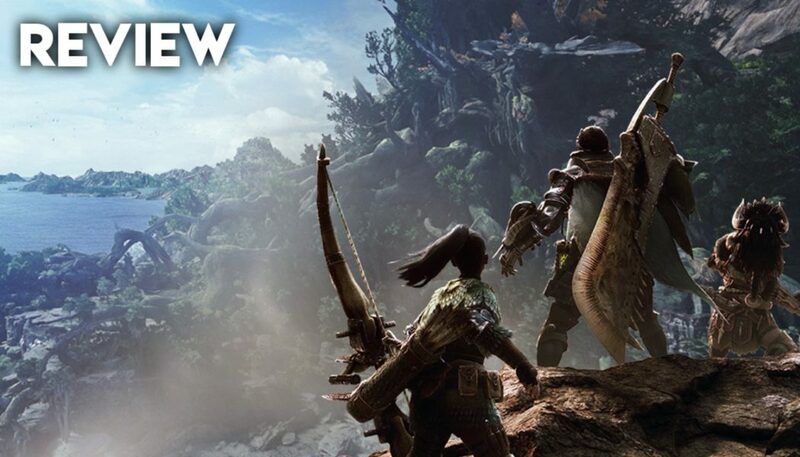 That’s not to say that this latest iteration of Monster Hunter is not far more accessible than any game that has come before. Sure, you’ll be drowning in menus often, but for the most part, the interface has been streamlined, and everything is fairly well explained. The story starts with you heading to the New World seeking answer to why an ancient Dragon has been roused. It’s a thin plot that is mostly there to service the gameplay. You create your character, outfit yourself with weapons and armor, and set out for the hunt. 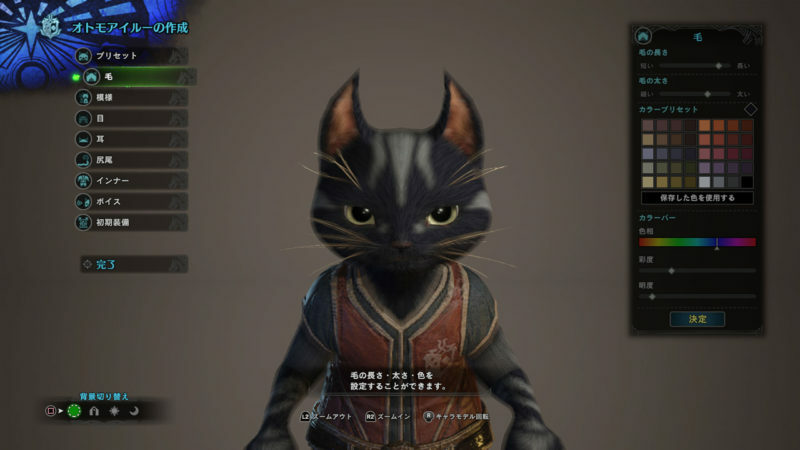 You also have a pet pal tagging along with you, called Palico. They are incredibly useful if outfitted properly, so learning about them is important. The hunts themselves are the real meat of the game, and oh my, are they meaty. The early few missions act as the tutorial and do a good job of familiarizing you with most of the game’s systems. There’s tracking, hunting, crafting, upgrading, cooking, trapping, and so much more. It’s a lot to take in, so be sure to take it slow and pay attention to everything. The central hub area is where you pick up mission and have a lot of NPC interactions. You get access to a wide array of weapons from the beginning, with a free range nearby. It’s not the best weapons tutorial, but is useful to know which weapons you might want to use. Other than the sword and shield, all the weapons are fairly unconventional with a lot of nuance to them. Even with all the time I spent with the game, I wasn’t able to pick just one favorite – there were so many of them that were good. The monsters themselves are the real stars of the show, and they are truly incredible. From the very early ones to those you fight later in the game, they are all unique in design, behaviour and engagement. You learn about them by tracking them, and set traps accordingly. However, even the best laid plans can go awry when multiple monsters enter the fight. Almost all of the fights has an epic sense of chase, fight and adventure to them. Killing them nets you rewards in terms of new loot and upgrades. And then you’re on to the next hunt. It’s a satisfying loop, that just keeps giving. However, if you’re not into this kind of lopp, it can tend to feel repetitive. That’s a very big “if” though, because Monster Hunter World is a joy to play. This also in part because of the diverse, dynamic and interactive ecology built for these monsters and you to play in. You can also call in friends to tag along for the fight, and this is where the game is at its best. The multiplayer is robust, easy to set up, and the game is an absolute blast in a party. Monster Hunter World manages to be inviting to new players, without losing any of the gameplay depth. Sure, there are still some old game design elements present here, and navigating the menus can feel cumbersome at times. However, the sheer number of systems present, and the way everything interacts with each other justifies some of the clunkiness. 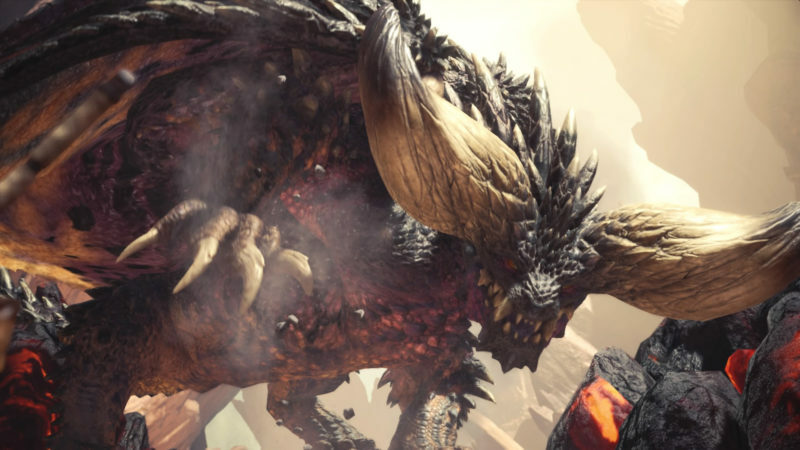 And, at its core, Monster Hunter World is an action packed adventure that will consistently impress the player.